An easy, but very tasty, one dish wonder. 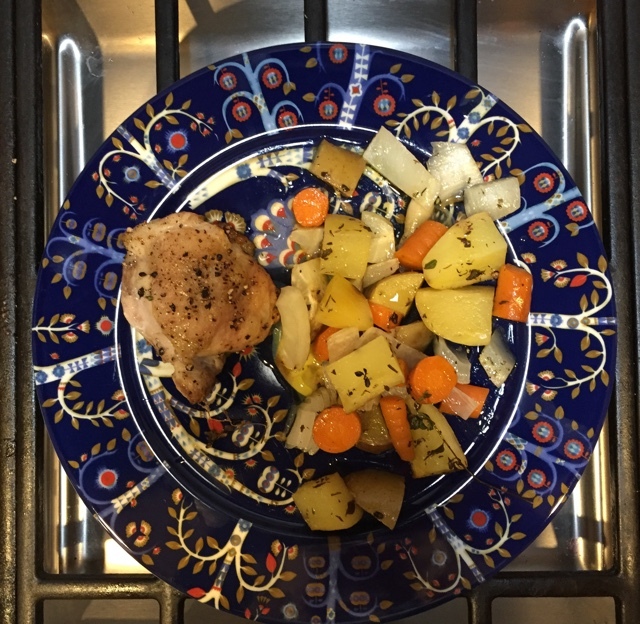 The chicken sits supremely on top, dripping its lovely juices into the vegetables. Combine all the vegetables in a very large casserole pan or rimmed baking sheet. Sprinkle liberally with salt, pepper, and dried thyme. Anoint with the oil and toss with your hands. Spread the veggies out so that they are in a single layer (otherwise, alot 10 minutes more baking time). Nestle the thyme sprigs among the vegetables. Start baking the chicken. After 15 minutes, arrange the chicken on top of the vegetables. Bake for a further 25 minutes or until the chicken registers 170 degrees F. with an instant-read thermometer. Serve soon after.